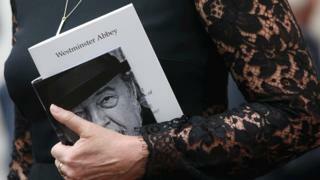 Dame Judi Dench, David Suchet and Vanessa Redgrave were among those paying tribute to Sir Peter Hall at a special service at Westminster Abbey on the first anniversary of his death. The Royal Shakespeare Company founder died at the age of 86, six years after he was diagnosed with dementia. Sir Trevor Nunn told the congregation: "This loss to the world of theatre, and indeed to the world, is immeasurable." Dame Judi performed a speech from Anthony and Cleopatra at the memorial. Suchet performed a speech from Amadeus, which Sir Peter directed at the National Theatre before it became an Oscar-winning film, while Redgrave gave a reading from the Bible's Corinthians. Other luminaries at Tuesday's memorial service included Sir Kenneth Branagh, Stephen Fry, Felicity Kendall, Twiggy, Sir Ian McKellen, Dame Penelope Keith, Sir Ben Kingsley, Joely Richardson, Sir Patrick Stewart and Ralph Fiennes. Sir Trevor described the moment he first encountered Sir Peter at Cambridge, saying: "From that moment on, I was ready to follow that man to the North Pole, to the dark side of the Moon. I had experienced the Peter Hall effect." Playwright Sir David Hare said: "The best way we have to honour his memory is try and give as much as he gave." Sir Peter was married four times. His six children offered prayers in celebration of his talents, and also to his "characteristic twinkle and his undeniable humanity". During the service, his family was described as "the greatest of his ensembles". Sir Peter became director of the National Theatre in 1973 and was responsible for the theatre's move from the Old Vic to the purpose-built complex on the South Bank. During his career, he staged the English language premiere of Samuel Beckett's Waiting for Godot and the world premiere of Harold Pinter's The Homecoming. After leaving the National in 1988, Sir Peter formed the Peter Hall Company, and in 2003 he became the founding director of the Rose Theatre Kingston. He also directed his daughter, the actress Rebecca Hall, in a 2003 production of Shakespeare's As You Like It. He was also a renowned opera director and was the artistic director of Glyndebourne Festival Opera between 1984 and 1990.